Indeed a pioneer is the company Gutgesel. In 1928 the Porcelain factory of Schney closed its gates because of the depression. Porcelain painter Nikolaus Gutgesell of nearby Korbmacherdorf startet painting baskets. That works out so well that an Opel Blitz truck is bought that year to distribute them. A second Blitz is build up as the bus in the picture. 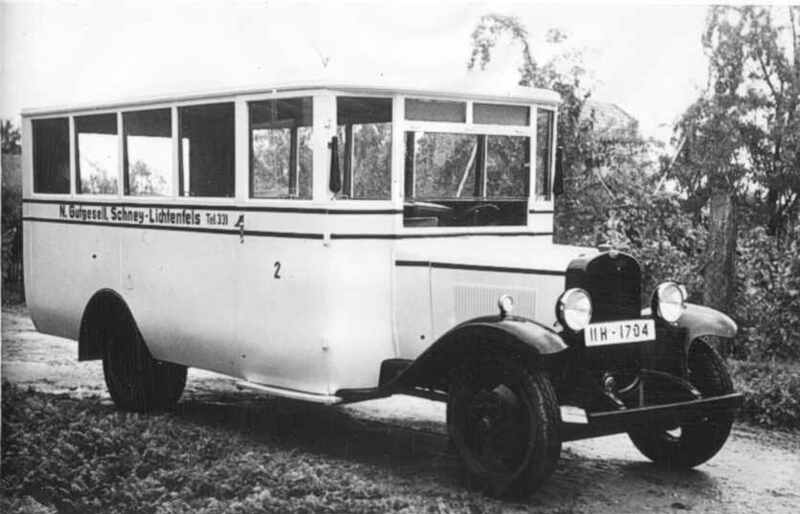 A second Blitz bus is bought in 1935 and named "Maintal - Express" with 38 seats for passengers. Ernst Gutgesell, son of Nikolaus, drives it to the Bodensee and to the Alps, for trips. More busses follow, but all are drafted with the driver into the war. The Gutgesel family and their company are still in business. 4th generation Tobias Gutgesell is the proud owner.